This was my first 'quality' car. 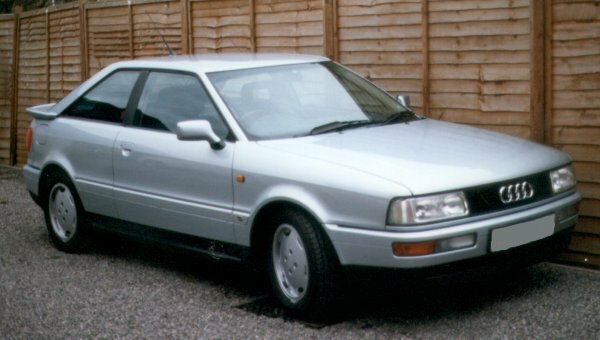 An 89G Registration, it was bought from Listers Audi of Worcester in April 1992 for �500. It was advertised for �995, so we got quite a good discount for cash. Once Listers had tidied up a few scratches, the car was absolutely spotless. It had done 23000 miles having had two owners over two and a half years. The car proved superb for most of the time, but towards the end of our ownership I had a few problems. In October 1993 I asked the dealer to check a slight coolant leak. They told me that the problem was because the radiators (Audi Coupe's have two) were worn out (at 40000 miles!). Replacement cost was �0. I asked Listers to fix it on the warranty that they had sold me. When the assessor looked at the car he found that one radiator was leaking, but that the other one was fine. Sounds to me like the garage was trying to get me to replace both. In December 1993 the car broke down for the only time. It was a problem with the starter motor. Dismantling proved that the starter motor had exploded, and that the ring gear (that the starter motor drives on to) was also damaged. I asked the dealer to fix it under the warranty but the warranty company would only pay for the replacement starter motor and it's fitting. Moreover, they would only pay for a 'pattern' starter motor, and wouldn't contribute towards the ring gear replacement. So I ended up with a bill for �0, which the warranty firm would only pay �7 of. All this from a "comprehensive" warranty. After months of arguing and letters, the warranty company eventually paid 2/3 of the bill (�0). Although the car was generally superb it was difficult to get into the back, and this along with some dodgy whining noises from the gearbox made me start looking for something with more doors. I traded it for the Audi 80 Estate for the measly sum of �50, after it had covered just under 60,000 miles. Looking back at this car, I'm pretty sure it had been clocked. There was a blank where the 20000 mile service should have been and I should have been more cautious. This might explain the various bearings that were worn out after a very easy 60000 miles.